In 1998, Toonami began airing episodes of Dragon Ball Z, and right from the get-go, my elementary school self was enthralled. My fascination with the show became an obsession, which led to countless hours spent online looking at photos of episodes yet to air. 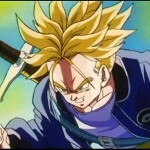 In the process, I discovered the existence of a character known as Future Trunks, who had not been shown in the show at that point in time. Needless to say, I spent a dozen more hours reading up on this character. Sadly, the TV show did not lend much of itself to the character’s story, or at least, not enough to satisfy me. So imagine my excitement when I found a VHS copy of The History of Trunks at our local video store. On many levels, I was practically in love with this movie, but on so many others I hated it. Let me clarify: I hated the original Funimation dub for two major reasons. First of all, the dialogue given to the voice actors is painful to listen to. The jokes are uninventive and cheesy as all hell. In most cases, the dialogue in the dub versus what is originally said are not even remotely similar, and nine out of ten times make the dub worse. I would know, as I now have a DVD copy with both languages. This is not a bash on the voice actors; they do a good job with the characters, but the dialogue they were given is just bad. Secondly, the music in the original dub feels very out of place, and does more to distract me than immerse me. Thankfully, Funimation heard the complaints on the music and rectified it, re-releasing the movie with the same cheesy dialogue but the original Japanese music. Hey, we can’t win all the battles, can we? On the plus, this movie has great atmosphere. 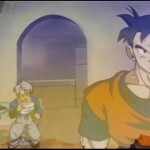 The animation starts off pretty light, but grows darker and more depressing as the movie progresses and we begin to realize just how futile things are for Trunks. This, coupled with some really great characters, does wonders for everything. Due to the dark and gritty world the characters live in, they turn out very differently from their counterparts in the TV show. 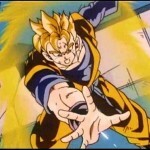 For instance, Future Gohan is a total and complete badass. 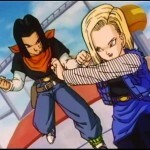 In the TV show, Gohan’s character is often overshadowed by other powerful characters, like his father, Vegeta, or Piccolo. So his character pales in comparison and is never really given much chance to shine until the Cell Games, after which he quickly returns to the backdrop. 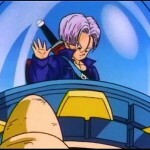 However, the best character development in The History of Trunks comes from the main man himself, Future Trunks. 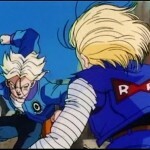 Throughout the course of the movie, we see Trunks transform from a hotheaded, impulsive child into a more calm but serious character, who fully realizes the gravity of his situation and knows full well that he has no choice but to follow his mom’s plan if he wants to make a real difference in the world. In the end, I have to say that The History of Trunks is a fantastic movie for those who are fans of the TV show, and especially of Trunks. For those who aren’t fans of the show in general, it is possible to watch this movie on its own, but watching the show first will likely increase the enjoyment you get out of it. However, I am sorry to say that I don’t recommend watching the English dub. The cheesy lines and reworking of minor details are just…really bad. Instead, I would recommend that you watch it in Japanese with English subtitles. It makes all the difference in the world. Trust me.